Chronic Obstructive Pulmonary Disease (COPD) is increasing rapidly worldwide and it's predicted that by 2020 it will represent the third leading cause of death. Sadly, this slow-progressing debilitating disease not only affects the individual but also has consequences for the family. More positively, the urgent need to improve the care offered and to raise the public profile of the condition has now been recognised. Healthcare providers play a central role in this, through health education, early diagnosis and better management through all stages of the disease. The future for the care and management of people with the condition. Healthcare professionals from multi-disciplinary teams have contributed to this book to demonstrate that a co-ordinated approach for these patients is required across both primary and secondary care. 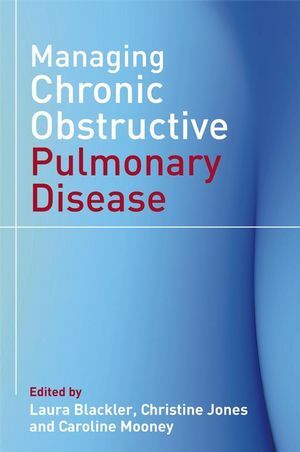 Managing Chronic Obstructive Pulmonary Disease can be utilised by nurses and allied health professionals caring for patients at all stages of their disease. Laura Blackler, Practice Development Nurse, Kings College Hospital, London, UK. Christine Jones, Respiratory Nurse Specialist, Kings College Hospital, London, UK. Caroline Mooney, Community Respiratory Nurse Specialist, Luton Treatment Centre, UK. Introduction (Laura Blackler, Christine Jones and Caroline Mooney). 2 Diagnosing COPD (William D.C. Man). 3.1 Pharmacological Management (Patricia Yerbury, Paul Bains and Vijay A. Selvan). 3.3 Nebulised Therapy at Home (Christine Jones). 3.4 Long-term Oxygen Therapy (Laura Blackler). 3.5 Surgical Interventions (Andrew Menzies-Gow). 4 Smoking Cessation (Sunny Kaul). 5 Pulmonary Rehabilitation (Amy Grant and Lauren Moore). 6.1 Fatigue Management (Tanya Navarro). 6.2 Nutrition and Healthy Eating (Richard C. Wilson). 6.5 Travel and Holidays (Caroline Mooney). 7 Psychological Needs and Interventions (Linda Fisher). 8 Management of COPD in the Community (Patrick White). 9 Management of Acute Exacerbations in Hospital (Jacqui Fenton). 10 Non-Invasive Ventilation (Tracey Mathieson). 11 End-of-Life Care (Fliss Murtagh, Mary Preston and Claudia Bausewein). 12 The Future for the Care and Management of Individuals with COPD (Laura Blackler, Caroline Mooney and Christine Jones).